You may wish to have replacement rollers ready before you disassemble the printer. 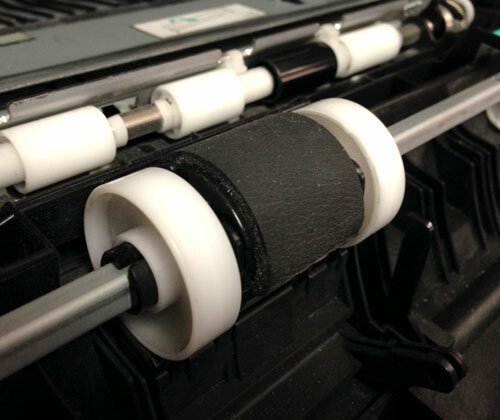 Contact the manufacturer or do a web search for your printer’s model and the term “rollers”. In some cases, the rollers may be included in a maintenance kit designed for your printer, which includes other replacement parts as well. Power down the printer, unplug it, and wait for up to 30 minutes before you begin to disassemble it, to be sure there is not electrical charge remaining. Remove the ink or toner cartridges to get them out of the way. Slide the input paper tray all the way out and remove it. If the tray isn’t removable, open any access panels to gain access to the rollers. Inspect the rollers and look for visual defects. Also, feel them to see if the surface is still rubbery with some grip. If the surface is too smooth, the roller will likely have trouble feeding paper, and should be replaced. You may want to try cleaning the printer rollers to see if it solves the problem before you replace them. Most rollers have snaps or tension clips on either side that hold them into place. In some cases, the entire roller assembly is attached to a single bar that can be removed. Once the old rollers are removed, snap the new roller in its place, and reassemble the machine. Power it up and test to see if the problem is resolved. Here is a video demonstration of how to change both the fuser and rollers in a few popular LaserJet models.